Lorenzo di Lotti, known as Lorenzetto, was a Tuscan sculptor in the circle of Raphael. He was active in Rome for some time, though Vasari judged his mysterious early activity as "not meriting being remembered." In 1519 he was given the important commission of the statues for the funerary chapel of Agostino Chigi in Santa Maria del Popolo. Raphael had provided the design for the statues, but Lorenzetto gave them a delicate, vibrant interpretation, with great skill and chiaroscuro softness. Lorenzetto produced the Madonna del Sasso for Raphael s tomb in the Pantheon, with the collaboration of Raffaele da Montelupo. The almost simultaneous death of Chigi and Raphael (the wealthy patron died in 1520 only four days after Raphael) heralded the decline in Lorenzetto s fortune. Clement VII gave him an important commission, the St Peter for Ponte Sant Angelo and the pendant of Paolo Taccone s fifteenth-century St Paul. 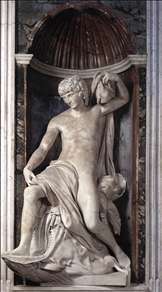 In 1524 Lorenzetto completed the tomb of Bernardino Cappella in Santo Stefano Rotondo, but in the tombs of the Medici popes in Santa Maria sopra Minerva from 1536 he contended himself with a subordinate role, with the statuary entrusted to Baccio Bandinelli. As compensation, he did more work (with Antonio da Sangallo the Younger) as architect-surveyor for the never-ending work on St Peter s. This position allowed him to live in style in the district where all the sculptors studios were to be found, from that of Andrea Bregno to Michelangelo. See more details about "Christ and the Woman Taken in Adultery"
See more details about "Jonah"